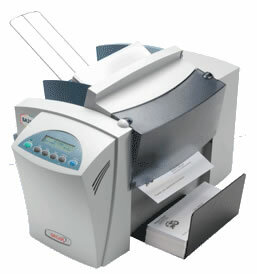 The Secap SA3000 is a compact, desktop address and imaging printer based on reliable HP inkjet technology. An excellent printer for the small volume mailer, offering the opportunity to get into direct address printing at an affordable price. on the mail piece at print qualities up to 600 x 300 dpi. This versatile and compact desktop printer makes addressing easy, and allows you to print envelopes, direct mail pieces, postcards, and other media right from your desktop.